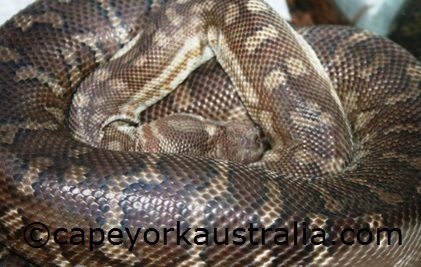 Australian reptiles is a huge group of animals. With more than 860 species, Australia has a huge variety of reptiles - more than three times as many species as what is found in the whole north America. Being the kind of animals that cannot produce their own body heat, reptiles need to rely on the outside temperatures for warming themselves up, and therefore they love warm climate. 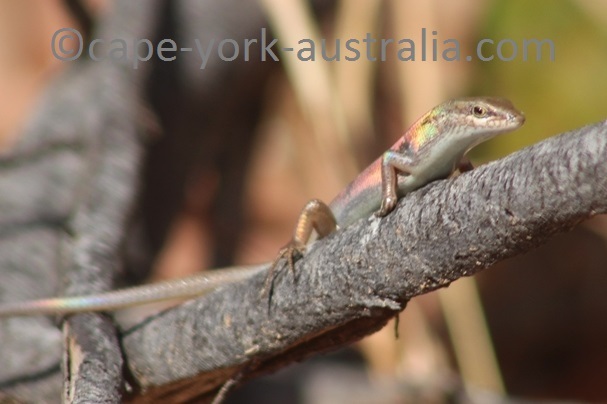 Australia has that, and northern Australia has even more than the southern parts of the continent - hence the abundance of reptiles in Cape York. 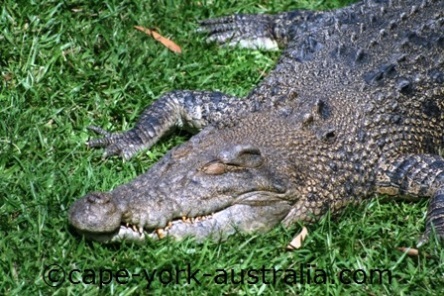 There are two species of crocodiles in Australia and both are only found in the northern parts of the continent. The smaller Freshwater Crocodile Crocodylus johnstonii has a slender snout and is found in freshwater creeks and gorges. It is the harmless species, even though it can bite when provoked, it does not kill us for food like the saltwater crocodile. The larger, Estuarine or Australian Saltwater Crocodile Crocodylus porosus on the other hand will kill a human to eat it. It is a quick and efficient killer, and it is huge - it's the largest reptile in the world. It is found in salt as well as fresh water but mostly in river estuaries. There are many species of both fresh and salt water turtles in Australia and Cape York. Freshwater turtles are found in freshwater rivers, lakes and billabongs. 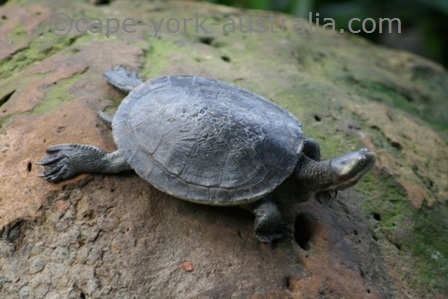 The ones we have in Cape York are Cann's Long Necked Turtle, Northern Long Necked Turtle, Northern Snapping Turtle, Saw Shelled Turtle, Krefft's Turtle, Northern Yellow Faced Turtle, and Jardine River Turtle. 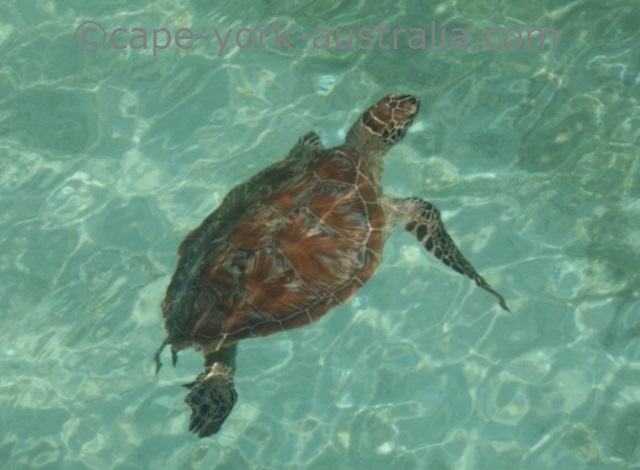 There are also several species of sea turtles in the warm, tropical ocean waters around the Cape York Peninsula, and they include Loggerhead Turtle, Green Turtle, Hawksbill Turtle, Flatback Turtle and Pacific Ridley Turtle. 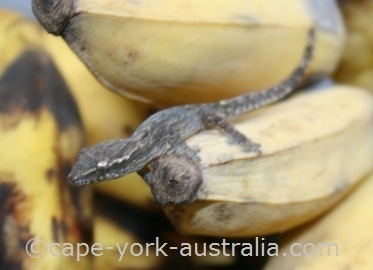 We have lots of lizards as (like many other Australian reptiles) they love our warm temperatures. Some of the more impressive ones, and quite easily seen ones, are the dragons. 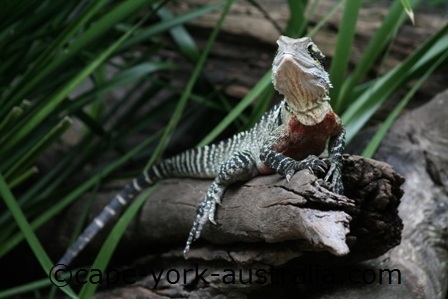 We have the Water Dragon, Boyd's Forest Dragon, Two Lined and Nobbi Dragons, as well as Tommy Roundhead, Ta Ta Lizard and Frilled Lizard, which is the most impressive one. With 370 species, skinks is the largest group of Australian lizards. The largest and most famous ones are the Blue Tongue Skinks, but we also have Garden Skink, Prickly Forest Skink, Major Skink, Eastern Striped Skink, Eastern Water Skink, Lively Rainbow Skink and Black Mountain Skink. 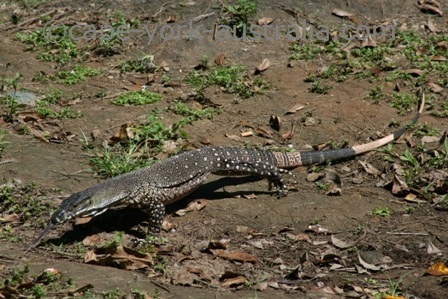 The largest Australian lizards are monitors and goannas. 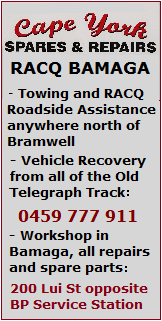 We don't have perenties but we do have the two metre Lace Monitor, Yellow Spotted Monitor, Sand Goanna, Mangrove Monitor, Canopy Goanna, Black Headed Monitor, Rusty Monitor and Spotted Tree Monitor. The strangest looking lizards are the legless lizards, aka flap-footed lizards - they are small snake looking animals that are totally harmless. In Cape York we have Burton's Snake Lizard, Northern Hooded Scaly Foot Lizard, the Common Scaly Foot Lizard and Delma tincta. And finally, we also have lots of snakes as they, too, love the warm temperatures. Pythons and colubrid snakes are harmless Australian reptiles. Australian largest snakes are pythons. They are non-venomous snakes and the ones we have in Cape York include Amethystine Python, Olive Python, Carpet Python, Water Python, Black Headed Python, Spotted Python, and Green Tree Python (endemic to the peninsula). This is another group of non-venomous snakes and the ones we have in Cape York are Brown Tree Snake, Slaty Grey Snake, Common Tree Snake, Northern Tree Snake, Keelback, White Bellied Mangrove Snake, Macleay's Water Snake, Australian Bockadam, and Richardsons's Mangrove Snake. We do also have venomous snakes. They all belong to the same family - Elapidae, and below are the main groups found in Cape York. There are two species of taipans in Australia. 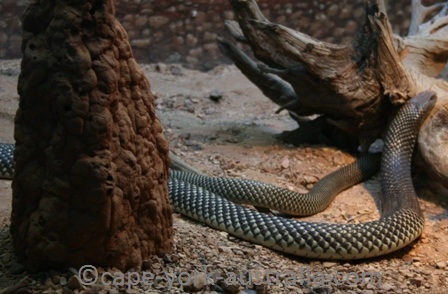 The more venomous - Inland Taipan, aka Fierce Snake (the most venomous snake in the world) is not found in Cape York. 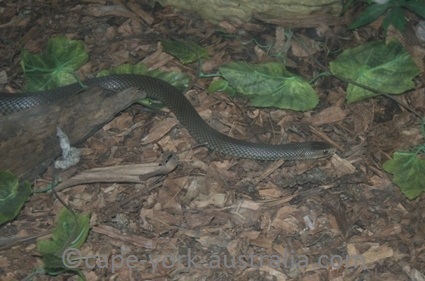 The other - coastal taipan, is less venomous but can be more aggressive and is found in Cape York. 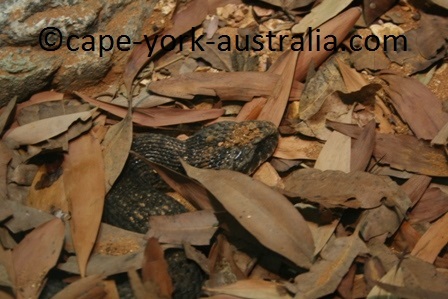 There are three species of Death Adders in Australia, and the only one that is found in Cape York is the Northern Death Adder. They are small, robust snakes that like to hide under leaf litter on the ground where they catch their prey. Something to remember when walking on leaves. 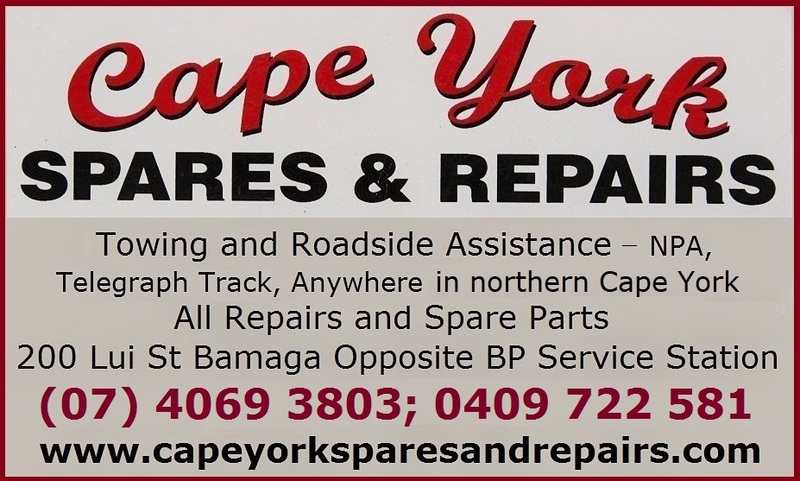 Out of Australia's six poisonous Brown Snakes, Cape York has two. 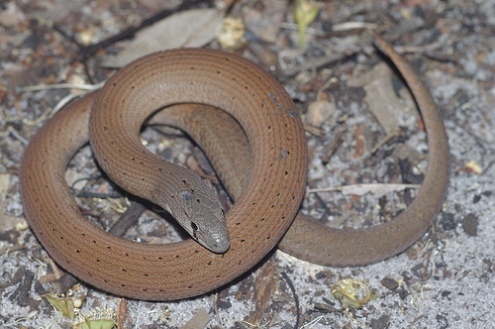 Common Brown Snake is found in almost whole eastern Australia, however in Cape York it is only found in the south-eastern parts of the peninsula. 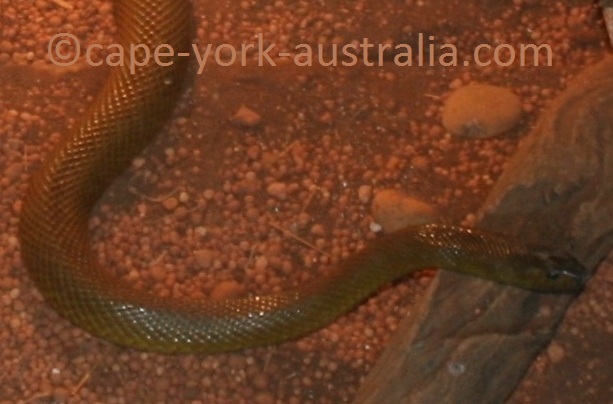 Western Brown Snake is found in the whole Cape York peninsula. 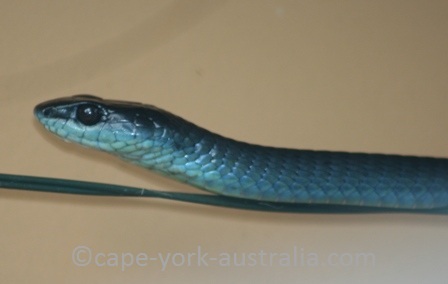 Out of Australia’s six species of Black Snakes, two are found in Cape York. King Brown, aka Mulga Snake, is the more common one, while Red Bellied Black Snake is restricted to a narrow coastal rainforest covered area along the coast between Cairns and Cooktown. 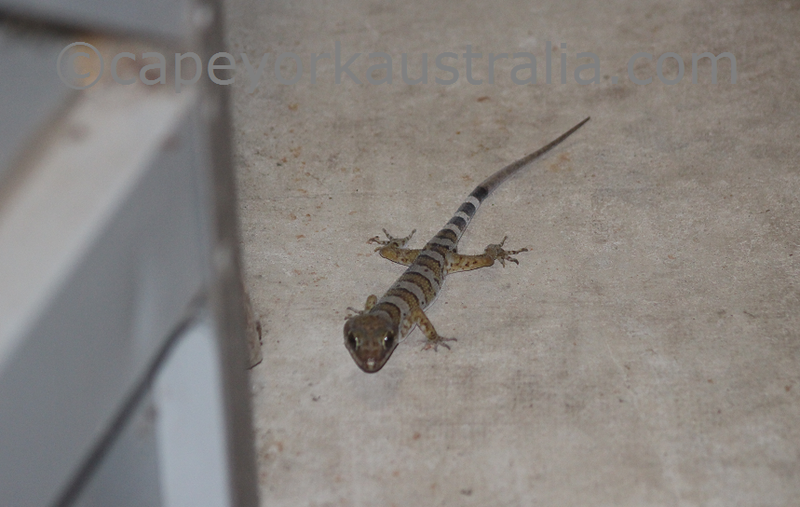 Yes, we have our 'own' gecko species in Cooktown - the Cooktown Gecko, also called Australian ringtail gecko (Cyrtodactylus sp.). 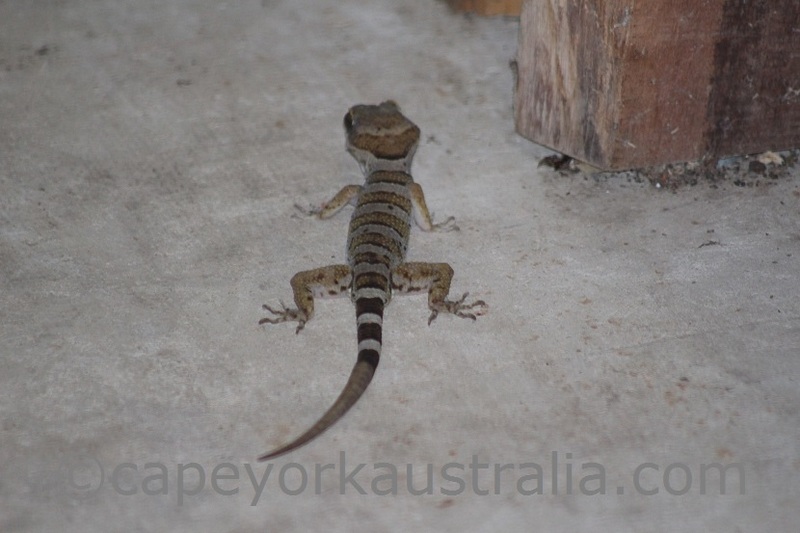 It is very large for a gecko, about 30cm in length, with a very distinctive stripy pattern. They are found roughly between Mt Molloy in the south and Coen in the north, and their natural habitat is rocks.